KUALA LUMPUR (April 28): CabNet Holdings Bhd, en route to list on the ACE Market of Bursa Malaysia on May 22, is seeking to raise RM11.76 million in an initial public offering (IPO), which will be used for working capital, research and development (R&D) expenses and to repay borrowings. CabNet is involved in the provision of building management solutions comprising structured cabling works and extra low voltage (ELV) systems, as well as information technology services. "Through the IPO, we aim to increase and strengthen our market presence in Johor, while pursuing more opportunities for more projects beyond Johor," its non-executive chairman Datuk Tan Kok Hong said at the launch of CabNet's prospectus today. "According to an independent market research, video surveillance is becoming an increasingly popular method to meet the demand for greater levels of security within the community. "Video surveillance cameras are widely used various purposes across various operating industries, which includes government sectors, retail, financial, educational and industrial sectors,” he added. 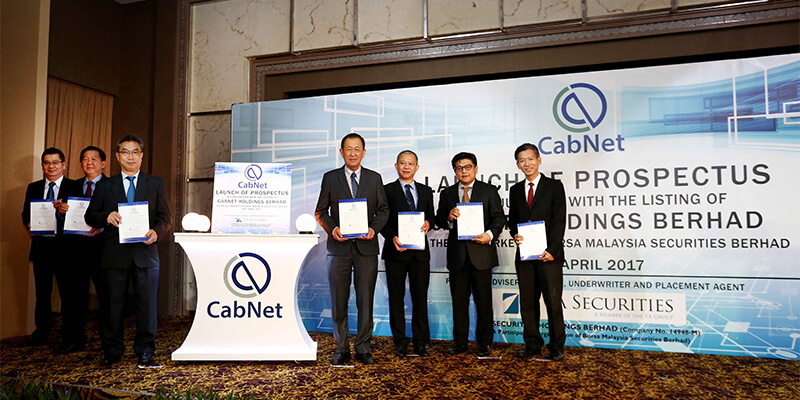 CabNet’s IPO entails a public issue of 21 million new shares, representing 16.15% of its enlarged issue share capital, at an issue price of 56 sen per share. In conjunction with the proposed listing, CabNet will strengthen its ELV system segment via CISS, an integrated security solutions software, besides also offering video monitoring solutions in collaboration with NetPosa Technologies Ltd as its strategic partner. Speaking at a press conference after the launch ceremony, CabNet chief operating officer Yong Thiam Yuen said it is looking for opportunities, as well as bigger projects beyond Johor. The company is eyeing to market its video surveillance cameras to townships and district areas. CabNet's co-founders — chief executive officer Tay Hong Sing and his deputy Tan Boon Siang — currently own a 29.91% stake each in the company. Following the IPO, the duo's shareholding in CabNet will be reduced to 25.08% each.